"No way, it's a toy!" It's Star Wars Scanimation! I still cannot determine how to classify this, except it fits in the EXTREMELY COOL category! Are you looking a very unique gift which is reasonably priced for your favorite Star Wars fan this holiday season? I have found it! The suggested retail is $14.95(US) $18.95(CAN), though you can get it between $10 and $11 (US) from most major book sellers. Amazon wins for best price from my research. My kids and I stumbled upon Star Wars: A Scanimation Book and have fallen in love with its simplistic genius which entertains over and over again. Rufus Butler Seder, creates optically animated artwork that engages the mind with oohs and aahs. He first came up with the idea of Lifetiles Animated Murals which grace the walls of many of our museums, aquariums, and other public places around the world. You have probably seen them if you have visited the Smithsonian in D.C., Sea World in FL, California Science Center, Bay Area Rapid Transportation's South Station in San Francisco, etc. As you travel past these walls of beautiful tiles, they seem to spring to life and animate on their own. After years of Lifetiles, among other pieces of optical artwork, Rufus started creating scanimation books, which topped the New York Time's Bestseller List. The newest book, Star Wars, released this year debuted at #1 on the list. Inside are 11 different scenes from Star Wars Episodes I-VI. Of course we had to figure out the science behind the book and that will be shared in the next post. Unfortunately, it did not work quite how we thought and thus trying to wedge some white paper behind the film to show you the black stripes on the clear film did not come to fruition. I was almost ready to dissect the book, but alas, I just could not bring myself to destroy such an amazing art book! Thankfully, I did not carry through after learning the artistic science behind this is more complicated than a "flip book." Levi, my son with autism, was delighted to find Darth Vader revealing his fatherhood (oops, another SPOILER spilled) and one of my other sons, Brett was intrigued that they brought out the colors in the characters, such as Yoda and his green light saber. Even the adults who have checked out this book have been intrigued with the optical illusions and the Star Wars theme. I watch everybody open and close the book slowly, investigating carefully, then speeding up the process, as if that will make it "click" as to the exact science behind this book. I enjoy the facial expressions; kind of like the first time I spied my kids' faces while watching Star Wars! You can buy this book for your Star Wars fan through almost any major book retailer. AND THE WINNER IS VIA RANDOM.ORG...#46 BECKYTAG...CONGRATS!!! Win It!!! 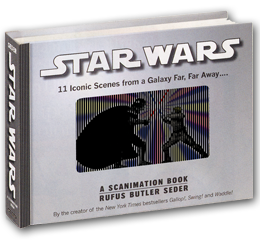 I have one copy of Star Wars, A Scanimation Book by Rufus Butler Seder to give away to one of my readers. You must be a resident in one of the 50 United States of legal age (usually 18+) or a US military base with an APO/FPO address (please enter only if legal in your state). Please leave your email address if it is not available in your profile. This giveaway begins on October 8th and ends on October 22nd at 11:59 P.S.T. Winner will be chosen via Random.org. 1. This is mandatory or all other entries will be disqualified and yes, I take the time to investigate. Please share with me who you want this book for and why they would enjoy it! 2. Follow me (publicly) on Google Friend Connect (in left column) and add a comment letting me know (1 extra entry). 3. Like my StarWarsMom page on Facebook and add a comment letting me know (1 extra entry). 4. Please visit either Scanimation's Website or EyeThinkInc (Rufus' art website) and share with me something new you learned about Rufus, Scanimation, or another form of his artwork and comment (1 extra entry). *The opinions expressed in this post are my own. All images in this post are © Copyright 2010 Rufus Butler Seder.